It is the policy of the Nunavut Impact Review Board (NIRB) to attract as many qualified candidates as possible within the limits of cost effectiveness to fill vacancies in existing positions or additional positions needed from time to time. The NIRB gives priority consideration to hiring qualified beneficiaries of the Nunavut Land Claims Agreement first, and Nunavut residents second. Applicants that are to be considered as a beneficiary or Nunavut resident must clearly identify themselves as a beneficiary or Nunavut resident in their application, and a candidate’s beneficiary or residency status may be subject to verification by the NIRB. All records of candidates, interviews, evaluations and determinations will be kept on file by the NIRB for two (2) years. The NIRB will also accept unsolicited resumes or curriculum vitae from individuals interested in being considered for potential future vacancies. The Nunavut Impact Review Board (NIRB) maintains up to date job descriptions for each of its staff positions. Each job description outlines the purpose of the position, the associated duties and responsibilities, and required qualifications. The NIRB recognizes that its staff members are instrumental in achieving the Board’s mission. Employees of the NIRB are provided with significant opportunity for job satisfaction, personal growth and career advancement. Students considering a future career in environmental assessment are encouraged to contact the NIRB regarding potential summer student positions, internships and mentoring opportunities. Under the direction of the Manager, Communications, Summer Students are responsible for providing clerical and administrative support to the Technical Services Department, and other duties as assigned. The Secretary/Receptionist provides clerical, administrative and executive support to the Nunavut Impact Review Board (NIRB). This position serves as a first point of contact in office reception, providing a welcoming and professional atmosphere and supporting Board, staff members and the general public as necessary. Reporting to the Director, Technical Services and under the supervision of the Manager, Technical Administration, Environmental Administrators assist in the receipt and distribution of project proposals in accordance with Article 12 of the Nunavut Land Claims Agreement and Part 3 of the Nunavut Planning and Project Assessment Act, acting as a first point of contact in the impact assessment process and providing information or directing inquiries, and managing the flow of information pertaining to environmental assessments. The Finance and Administrative Clerk provides day-to-day accounting, financial, human resources and general administration services to the NIRB. This position provides key support to the Director, Finance and Administration in areas of record management, data entry, payroll and general accounting. Reporting to the Director, Technical Services and supervised by the Manager, Technical Administration, the Junior Technical Advisor aids in the environmental assessments of proposed development projects and the monitoring programs for approved projects. With a focus on undertaking screening level assessments and assisting in daily administration of associated public registries, this position also assists more senior technical staff with impact assessments and community engagement tasks. The Outreach Coordinator is responsible for coordinating the NIRB’s public engagement initiatives and community outreach activities. This position assists technical staff with meetings logistics and serves as a key contact to the general public, providing friendly and accessible support to ensure events are well advertised and attended. Reporting to the Director, Finance and Administration, the Senior Finance Officer is responsible to provide day-to-day accounting, financial, human resources and general administration services to the Nunavut Impact Review Board. This position provides key support to the Director of Finance and Administration in areas of record management, data entry, payroll and general accounting. The Human Resource Officer provides support for the NIRB’s human resources planning, employee performance monitoring, and administration of staff leave and travel requests. This position serves as a key contact for Board and staff member human resources matters, providing accessible advice and assistance with recruitment, administration of policies, training and continued professional development. Reporting to the Director, Technical Services, the GIS Specialist will develop and maintain the NIRB's Geographical Information Systems (GIS) database and maps related to environmental impact assessment. This position provides key technical support to Board and staff, contextualizing information for assessments and enabling enhanced understanding of potential environmental effects through increased situational awareness and cumulative effects analysis. The Environmental Technologist assists in the development and maintenance of the NIRB websites, databases and systems through a combination of self-directed work and liaising with internal person and external agencies/organizations. This position ensures the consistent and accurate delivery of technical and general information in an accessible online format for the general public. Reporting to the Manager, Communications, the Interpreter/Translator I is responsible for providing Inuktitut/English and/or Inuinnaqtun/English interpretation and translation services to the Nunavut Impact Review Board. Reporting to the Manager, Communications, the Interpreter/Translator II is responsible for providing professional Inuktitut/English and/or Inuinnaqtun/English interpretation and translation services and also mentoring the Interpreter/Translator I position while contributing to efforts to document and promote advancement of Inuktitut/Inuinnaqtun terminology and usage within the impact assessment process. Reporting to the Director, Technical Services, the Manager, Technical Administration is responsible for overseeing the daily maintenance of the online and hardcopy public registries associated with NIRB assessments. This position oversees the incoming and outgoing communications for the Technical Services Department, directing inquiries and managing flow of information pertaining to Screening and Review assessments and monitoring programs. The MTA is responsible for the direct supervision of Environmental Administrators and Junior Technical Advisors, and acts as liaison between the Director and technical staff, assisting with the assignment of Screening assessments and coordinating/tracking assessments specific deadlines, communications and materials. Reporting to the Executive Director, the Manager of Communications is responsible for coordinating the communication of NIRB processes, events, and decisions to Government, Inuit organizations, community organizations and the general public. This position provides oversight and creative support to the Board’s public engagement efforts, ensuring communications are professional, accessible, delivering key messages to target audiences. Reporting to the Director, Technical Services, the Technical Advisor leads the environmental assessment of proposed development projects and the monitoring programs for approved projects referred to the NIRB under Article 12 of the Nunavut Agreement and Part 3 of the Nunavut Planning and Project Assessment Act. With a focus on managing multiple screening level assessments and assisting in the assessment for major development projects, this position advises senior management on technical issues, ensuring that assessments are undertaken in a fair, inclusive and timely manner. The Technical Advisor II leads the environmental assessment of proposed development projects and the monitoring programs for approved projects referred to the NIRB under Article 12 of the Nunavut Agreement and Part 3 of the Nunavut Planning and Project Assessment Act. With a focus on managing the assessment and monitoring programs for major development projects, this position may act as a subject-matter expert when providing advice to senior management and the Board, ensuring the assessment are undertaken in a fair, inclusive and timely manner. The Manager, Human Resources oversees human resource planning and employee performance monitoring through coordination of processes for employment recruitment and retention, and continued professional development. This position serves as a key contact for Board and staff member human resource matters, providing accessible advice and assistance with recruitment, administration of policies, employee counselling, training and continued professional development. The Manager, Impact Assessment leads the environmental assessment of proposed development projects and the monitoring programs for approved projects to the NIRB under Article 12 of the Nunavut Agreement and Part 3 of the Nunavut Planning and Project Assessment Act. This position is responsible for providing support to the Director, Technical Advisor by coordinating development and standardization of impact assessment methodologies, procedures and guidance materials. The Manager Project Monitoring leads the environmental assessment of proposed development projects and the monitoring programs for approved projects to the NIRB and Part 3 of the Nunavut Planning and Project Assessment Act. This position is responsible for providing support to the Director, Technical Services by coordinating development and standardization of impact assessment methodologies, procedures and guidance materials. The Policy Advisor provides objective analysis and advice to the NIRB regarding various internal and external policy, planning and legislative initiatives. This position directly assists the Executive Director in identifying contentious issues, alternative options, policy gaps, financial/legal implications, interdepartmental and external impacts and consistency with the NIRB mandate. Supervising a multi-disciplinary team, the Director, Finance and Administration oversees financial, administrative and human resources support services to the Nunavut Impact Review Board (NIRB), ensuring compliance with relevant legislation, regulations, sound accounting/business practices, policies & procedures and funding agency’s reporting requirements. This position advises the Board directly on finance and administration issues, ensuring that the NIRB maintains accurate, transparent and responsible accounting practices. Reporting to the Executive Director, the Director of Technical Services supervises a multi-disciplinary team, leading the environment assessment and monitoring processes for all project proposals referred to the NIRB under Article 12 of the Nunavut Agreement and Part 3 of the Nunavut Planning and Project Assessment Act. This position advises the Board directly on technical issues, ensuring that assessments are undertaken in a manner which respects NIRB’s need for procedural fairness, transparency and timely decision-making. 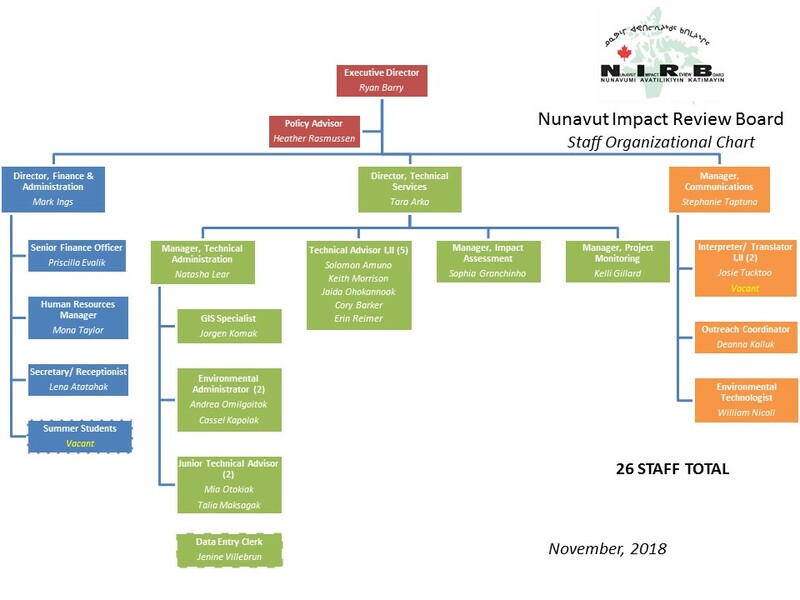 Under the direction of the Chairperson of the Nunavut Impact Review Board (NIRB), the Executive Director is responsible to provide the direction, leadership and ongoing management of NIRB operations and staff and provides advice, direction and recommendations to the Board Members regarding the mandated duties of the NIRB.